The Ardeche is located in the Rhone Alps and borders the Languedoc, Provence and Auvergne. It is a department that has warmly embraced the tourist industry and has fully developed its potential to offer fun packed family holidays and relaxing breaks. It covers an area of 550,000 hectares and contains 286,000 inhabitants. The climate tends to be as varied as the landscape. The South is the most popular location and has a year round temperature similar to that of Provence. There are five distinct geographical regions within the department. 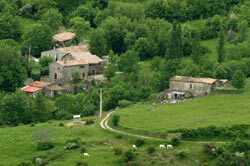 Green Ardeche is located in the North and has the most relaxing atmosphere. The Ardeche Plateau is to be found in the West and has a pleasant climate. It is mostly covered with forests and mountains. The Pays de Privas is located in the East and makes a great base. It is rich in culture and gastronomic delights. The Aubenas area used to be the main trading crossroads. It contains a number of fascinating villages, which have preserved their traditional way of life. Lastly, the South of the Ardeche is the most popular with tourists due to its dry and hot climate. It is here that you will find the Gorges de l'Ardeche and the Pont d'Arc. 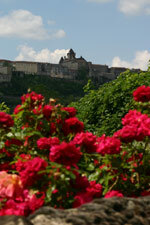 Privas is the capital of the Ardeche. It has a population of just over 10,000 and sits at an altitude of 200 meters. The town was originally a protestant stronghold yet suffered badly during religious fighting. It has largely been rebuilt, although there are a number of ancient houses that survived the destruction. The immensely impressive Gorges de l'Ardeche extend over 35 km. They became part of a nature reserve in 1980 and since then have been attracting tourists from all over the world. Due to geological changes, the gorges sprung up 110 million years ago and have created canyons, potholes and caves inside them. Make sure you see the Pont d'Arc, an incredible 66 meter opening in the rock face. The river Ardeche that runs through the gorges is a great place for canoeing. If you're put off by the fast flowing water then you can take the scenic path up above and follow the river on foot. The nearest airports with direct UK flights are in Lyon, Nîmes, Avignon and Grenoble. Flying to Valence involves a change in Paris. The TGV train service stops in Grenoble, Valence, Aix-en-Provence and Nîmes. Privas can be reached in 40 minutes from Montelimar or Valence. There are possibilities for renting out your property near the gorges. You should also be able to find cheap properties that require renovation. At the time of writing, we have a stone house in the country, between Privas and Aubenas for 66,000 euros. Do you know Ardèche better than we do? Do you have photos of Ardèche? In the south west of the Rhone-Alpes.